Many people do not like asparagus because all they have ever tasted came out of a can. However, asparagus is considered a high end gourmet treat by connoisseurs around the world. They are a pricey item because the season is so short and fresh supply limited. If you are one of many who enjoy the delicate flavor of asparagus and you have room in your garden, you should definitely consider planting a few crowns. 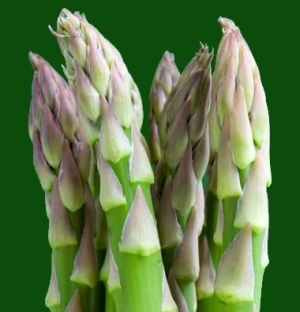 A dozen or so plants will provide you with 5 to 6 pounds of asparagus every spring. The plants are long-lived and will yield for 20 to 25 years. You may consider your asparagus bed a long term investment, but you will have some work at the beginning to ensure success. Preparing the soil in the planting area is the most important first step. Asparagus roots grow horizontally and need space to spread. In addition, crowns must be planted deep so that plants can develop properly with the base of the stalks well beneath the soil level. Buy yearling plants of proven stock and quality such as Jersey Knight, Purple Passion or the rust-resistant Washington strains. Even though more expensive, don't make the mistake of purchasing two year or older crowns. They will lose a lot of roots which in fact sets them back to a condition less that one year olds. It is important to select a well drained site that will receive no less than 6 hours of sunshine per day. In fall or spring, whenever you can obtain crowns, dig a trench about 15 to 16 inches deep and 2 feet wide, placing the excavated soil along the side of the trench for later use. On the bottom of the trench, spread and tamp down well-rotted manure to a depth of 3 to 4 inches. Cover this with 4 to 6 inches of rich garden loam or compost. On top of this, place your asparagus crowns by spreading out the root system in a horizontal manner with the bud side upwards. To ensure the finest quality spears, individual plants should be spaced at least 18 and up to 24 inches apart. Firmly cover the plants with one to two inches of topsoil, ending up with the plants being about 6 inches below ground level. If you are planting in the fall, fill the rest of the trench with leaves or straw which will be removed in the spring. Once the growing season starts, periodically loosen the soil from the sides of the trench and add a little of the original topsoil which you put aside when first preparing the bed. By the end of the growing season, the trench should be filled level with the surrounding ground. Don't try to harvest any spears the first and second year after planting or you will risk setting the plants back - they will need all the nourishment they are able to store to get them off to a good start. In the third spring after planting, harvest a modest crop only two or 3 times during the season. Fertilizer may be applied in late spring and a yearly top-dressing of well rotted manure can be used in the fall. If you enjoy white asparagus, there is really no secret to having them. The idea is to keep out the sunlight to prevent the chlorophyll in the tissues from turning the stalks green. Just when spears are beginning to break through, mound them with soil, mulch or cover with anything else that will keep the light out, a bucket, black plastic bags, carboard box, etc. Asparagus will grow 5 to 7 inches a day in hot weather and therefore can be harvested on a daily basis once the plants are 3 years or older. So there you have it - an investment in labor and time. But by now, you will have a well established asparagus bed that will serve up the goodies for years to come.